USGS hypothetical earthquake scenario map tool. The US Geological Survey just released an online interactive map tool that showcases earthquake event scenarios for select faults in the contiguous U.S. Their objective: "to convey event locations, rupture areas, and shaking for hypothetical earthquake scenarios." This is a great idea. 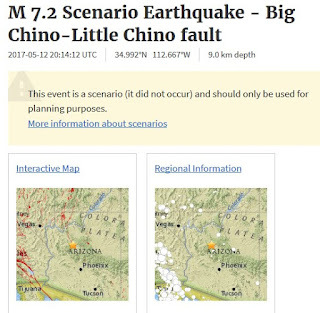 It provides state, county and local emergency management teams with a much needed tool for planning and informing their communities about the hazards, risks, and likelihood of large magnitude earthquakes. This approach dovetails nicely with FEMA’s efforts to build awareness of the impacts of natural hazards, and more specifically, with the Great ShakeOut program’s efforts to inform people how to behave before, during and after a large magnitude earthquake. 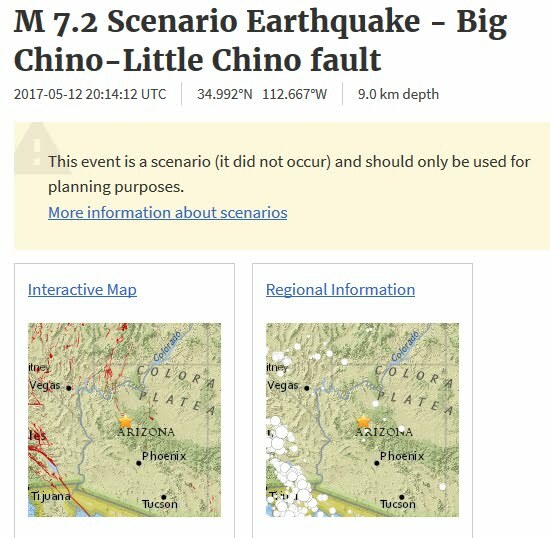 USGS earthquake scenario for Big Chino-Little Chino fault. Large earthquakes are inevitable and the Western U.S., including Arizona, is particularly prone to damaging seismic events. Each year, AZGS’s broadband seismic network records ~ 100 earthquakes in Arizona and along its border regions with California, Nevada, Utah, New Mexico, Colorado, and Mexico. Most of these events are unfelt. Putting geoscience to work for Arizona. AZGS’ seismic and IT teams are fleshing out the existing statewide broadband seismic network, deploying new seismometers in northern Arizona, deploying an automated alert system. Once the seismic equipment upgrade is complete, we should have the capability to detecting all M2.5+ earthquakes in Arizona and environs. AZGS staff works closely with FEMA’s National Earthquake Hazard Reduction Program (NEHRP) and the Arizona Dept. of Emergency Management & Military Affairs to share information with the Arizona public, government, private enterprise and NGOs on how to protect themselves, their property, and assets from the impact of damaging earthquakes. To get involved in earthquake preparedness, register and participate in the 2017 Great Arizona ShakeOut scheduled for 19 Oct. 2017 at 10:19 a.m.